Here’s a round up of upcoming performances of interest over the next week or so. Sunday at 3.15pm TIFF are showing Jean-Marie Straub and Danièle Huillet’s films Introduction to Arnold Schoenberg’s “Accompaniment to a Cinematographic Scene” and Moses and Aaron. The films will be preceded by a live performance of a Schoenberg piece by Adanya Dunn and Topher Mokrzewski. More details here. How can peace come from so much pain? Making a film of an opera rather than filming an opera involves interesting choices and one of the strengths of the DVD of Penny Woolcock’s film of John Adams’ and Alice Goodman’s The Death of Klinghoffer is that includes 47 minutes of Woolcock, Adams and others discussing just how one takes a rather abstractly staged opera (the original staging was, inevitably, by Peter Sellars) and turn it into an essentially naturalistic film. 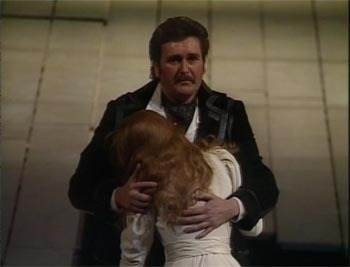 Of course, naturalism will only go so far with opera but this goes a long way in that direction. The soloists are filmed mainly on location and they sing to the camera. 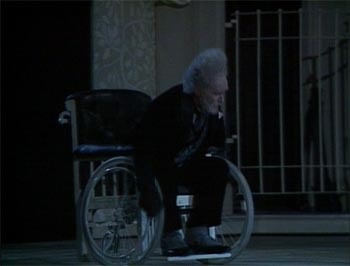 The choruses, mainly backed by documentary footage, and the orchestra were recorded in the studio but the actors sing ‘live’. The one concession to “being operatic” is having a mezzo voice one of the Palestinians though he is played by a male actor. 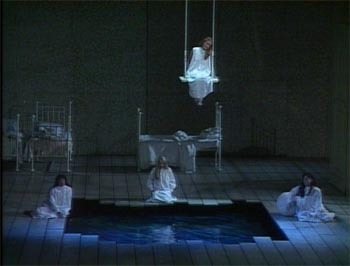 David Pountney’s 1986 ENO production of Dvorak’s Rusalka is set in an Edwardian nursery. The action is all a dream or a figment of Rusalka’s imagination in which her grandfather, in a wheelchair, becomes the Water Gnome, her sisters water sprites, her governess the witch Jezibaba and so on. In Act 1 it works reasonably well. Clearly we are looking at a metaphor of Rusalka escaping the nursery for adult life with all the risks and discoveries that involves. It starts to get pretty strained in Act 2. There’s some not very subtle loss of virginity imagery but that’s about it. By Act 3 Pountney seems to have run out of ideas and the final denouement is played out pretty straightforwardly. Certainly there’s nothing in the ending to bring closure to the concept which seems like a cop out. The performances, in English this being ENO, are mostly OK but not stellar. Elaine Hannan has a clear bright voice which suits the idea of Rusalka as a young girl but she doesn’t have the range of colour or dynamic range of, say, Renee Fleming. John Treleaven is rather good, if a bit stiff, as the Prince. You can definitely hear heldentenorish qualities in the voice. It’s a shame that, with his ‘tache and sideburns, he looks like a 1970s lounge lizard. Ann Howard is vocally competent as the governess/witch/Jezibaba but while she’s be fairly scary in a schoolroom she isn’t really the stuff of nightmares the part needs. Rodney Macann is a straightforwardly effective grandfather/Water Gnome but he doesn’t really dominate. The other parts are all quite well sung tough far from thrilling.Mark Elder conducts a rather routine sounding reading from the ENO Orchestra and Chorus. To be fair, part of the problem may be the sound, see below. The video direction by Derek Bailey needs to be taken on its own terms for a record of what’s happening on stage it isn’t. There are lots of superpositions and some weird camera angles. It does reinforce the “dream” aspects of the production so I think it can be considered a valid approach. Technically this is not a great disk. The 4:3 picture is 1986 TV to DVD quality. I suppose that, in a way, reinforces the dream quality too. The sound is very average Dolby 2.0. At times it’s worse than that. At the end of Act 1 it sounds like Treleaven is singing from the bottom of a well and nowhere does it do the orchestra any favours. There are no subtitles and the less than vivid sound makes it even harder than it otherwise might be to figure out the words. Documentation is limited to a track listing. Given that Robert Carsen’s fascinating Paris production; strongly cast and well recorded, is also available on DVD it’s a bit hard to see why anyone would bother with this one.